Drive a 35 year old Royal Enfield motorcycle 6,000k through India and Nepal, then drive it to Spain 15,000k (9000 miles) and raise $25,000 for charities in the process. Meet Bala. She is a 500cc Royal Enfield Bullet. She will be my travel companion, my trusty steed, my Rocinante. She was born in India in the 70’s (Never ask a lady her exact age) but the engine that powers her is of an engineering design that has basically not changed since the 1950’s. No fancy technology, no fuel injection, just one big hog of a cylinder surrounded by cast iron. Her name, Bala, is an old Hindi/Sanskrit name that means “powerful”. Coincidentally it also means “bullet” in Spanish. So she carries in her name something of her origin as well as of the place she will eventually call home. Is a motorcycle that was engineered over 60 years ago, with a top speed of about 65kph (45mph) a practical choice to drive from India to Spain…over mountains, through rivers, across deserts? No. Not at all. Will she break down? Yep. Do I know heaps about mechanics? Nope. Will it be hard? For sure. Is it even possible? I’m about to find out. When you begin a long and challenging adventure with someone, you learn to love that person, to depend on them for company, for support and for encouragement. You also sometimes want to kick them in the arse and leave them on the side of the road. And so it goes with Bala and I. She’s a firecracker. She’s a rock. She’s an incorrigible teenager, a sassy old lady, and an attention seeker. She is loud and demanding, determined and loyal, obstinate and argumentative. She is Marilyn Monroe AND James Dean. Unfortunately I had to give up the idea of reaching “The Stans” by passing through Pakistan and China. Pakistan is not so keen on letting Indian registered vehicles across the border these days, and China will only let you pass if you pay $1500 to a guide that will accompany you 24 hours a day for the 6 days t take to reach the Kyrgyz border. So unfortunately I had to cheat a bit and Bala and I flew from Delhi to Bishkek Kyrgyzstan and will head overland from there. Iran is also a wildcard…hopefully I get the visa. If not we cross the Caspian Sea by ferry from Turkmenistan to Azerbaijan. I’m a 34 year old citizen of the world who has been on the road for several years in search of Life’s diamonds and pearls. CLICK HERE to read more. HOW CAN I FOLLOW YOUR PROGRESS, TO READ STORIES AND SEE PHOTOS FROM THE TRIP? Very easy. To the right side of the screen towards the top you will see an option for “EMAIL SUBSCRIPTION”. Enter your email address there, click “Sign Me Up” and then check your email, you will have an email you must open to confirm your subscription. HOW LONG WILL THE TRIP TAKE? I can only guess. But I plan to be heading out of India in April or May of 2014 and imagine I will take about 3 months to reach Barcelona. In the meantime I am busy dodging cows on some road in India somewhere. HOW MANY COUNTRIES WILL YOU PASS THROUGH? Depends on a few things but let’s say 15 to 20. HOW MANY MILES/KILOMETERS WILL YOU TRAVEL? ARE YOU DOING THIS ALONE? Essentially yes… but there will surely be people joining along the way. Bala can take one passenger so I will pick people up that I meet who want to join us for parts of the trip. There are also a few other riders who are interested in joining but nothing is certain. WAS IT EASY TO FIND AND BUY A DECENT MOTORCYCLE IN INDIA AND TO REGISTER IT IN YOUR NAME? WHY NOT DO IT ON SOME MODERN MORE EFFICIENT MOTORCYCLE? I will not tell Bala that you asked that question. Is a motorcycle that was engineered over 60 years ago a practical choice to drive from India to Spain…over mountains, through rivers, across deserts? No. Not at all. Will she break down? Yep. Will it be hard? For sure. But will it be more of an adventure? YES!!! DO YOU HAVE ANY REAL MECHANICAL EXPERIENCE? Nope. I grew up around motorcycles so have some general knowledge but I will be learning a lot over the next months. As Bala is a “vintage” bike I am going to be doing a complete engine rebuild with the help of the guys at Vintage Rides in Delhi so that when I leave India Bala will be in tip-top shape. I will have to take lots of spares as well as tools to fix most issues. Out of India it will be hard to find some parts so I will be carrying with me extra clutch plates, cables, tubes, filters, gaskets, a bike pump….and a flask of whiskey for when none of other things can save me. Once leaving India I will also be traveling with a tent and sleeping bag as I plan to spend more than a few nights camping. IF YOU HAVE ANY OTHER QUESTIONS YOU WANT ANSWERED ABOUT THE TRIP FEEL FREE TO LEAVE THEM IN A COMMENT AND I WILL ADD THEM HERE ALONG WITH THE ANSWERS. UPDATE: Mission Accomplished! After 5 months on the road, 12,000 kilometers, and 20 countries, I arrived in Barcelona! It wasn’t long before I was planning my next adventure, which I have already begun. You can read more about that here. This sounds awesome! Believe it or not, i was thinking about doing somewhat the same only then from India to Den Haag – Netherlands my hometown! Enfields are such great motorcycles! Enjoy your trip and i will be looking forward to the updates in your blog! Have u reached Barcelona yet? This is fantastic! I’ve read only a few posts so far and I’ve really enjoyed them, especially the parts about the kindness of strangers. Looking forward to reading everything else! i wish i had a life like yours..no strings..just flow like the wind and no responsibilities and no tension………….you are damn lucky my friend…. this trip seems like a dream come true for every rider at heart.. i really wish to follow these footsteps of yours and hope one day will reach. bro do post the logistics regarding this trip. Hey! Thank for the well wishes. I will indeed someday make a post that is more focused on the logistal “how to” part of the trip. Keep dreaming. Don’y be sad my friend, I might have some stories to tell, but your mind carries all the same richness as mine. And in that you can find all the pleasure and adventure you need in life if you learn how. I will post again soon…stay tuned! How often you take rest wen traveling? Its a dream come true for every rider The route is awesome even I love and dare to ride with u guys. . Thanks! If you ever find yourself in Spain I can give you a ride on Bala! Hey, how did you find my blog? What about visa issues? Does one have to get visa from all countries crossed? Can I ask, how did you find my blog? Hai Jordan. Try riding through the Nordic countries in summer!!!! It’ll be amazing!!! Hey! As a matter of fact I am planning to do that next summer! I want to buy an old Ural in Finland and then drive it around up there and back to Barcelona. Hey, how did you find my blog? How did you get the registration of the bike in your name ? How did you get the “carnet de passage” for the bike ? Did you have the driver’s licence before or did you get it somewhere in Asia ? Getting the bike in your name in India is complicateed. I was working in Delhi so was on a work visa, this allowed me to get Indian residence so it was possible. The other option is just to buy the bike and then get fake papers made in your name. We didnt have to get a Carnet because none of the countries we passed through required one. We could not go through Pakistan, we flew with the bike from Delhi to Kyrzystan. We avoided Iran by taking the ferry across the caspian sea from Turkminstan to Azerbaijan…if you do it this way you dont need a Carnet. I had a motorcycle license but actually I crossed about 15 borders before ever being asked to see it. The first time someone asked for my drivers license was in Bosnia. The whole trip was actually pretty complicated to plan, visas in central asia are no joke. But it was absolutely worth the effort. truly amazing. I hope you can make it possible! Hey, can I ask, how did you find my blog? Thank you so much for your quick answer ! Why you didn’t get the “carnet de passage” ? Did you choose it or was it very difficult to get it ? Actually, I’m planning to start the trip next January ! Hope everything will be ok ! A friend of mine sent me your blog but i don’t know where she found it. I think from Facebook page called ” Nomads something”. Could you explain me how is it to fly with your bike from India to Kyrgyztan ? What is the process ? Because, Tibet is closed till April and we would like to start the trip before. Yea, the process was surprisingly simple, when you pass the responsibility on to the people how know how to do it. Of course its not cheap, but in the end was only slightly more expensive than going through China with the cost of visas, permits, and guides. Contact Rahul (who manages the garage) at vintage rides http://www.vintagerides.com/. Tell him Jordan sent you, he will help sort you out with transport. In general the guys at Vintage can be a great resource to you. Its inspiring and motivational. Actually, I was also planning a trip like this, But from Kerala, India to Austria. Hope I could make it soon,. Jordan where are you right now? Amazing write-ups. What an incredible journey. Though, I would still want to read the about the rest of your journey from Georgia to Barcelona. You are an inspiration. It will be an honor to share a beer with you mate. I owe you once when you are in Delhi, India. this is Chiara from Italy! I’m so happy to have found your blog! 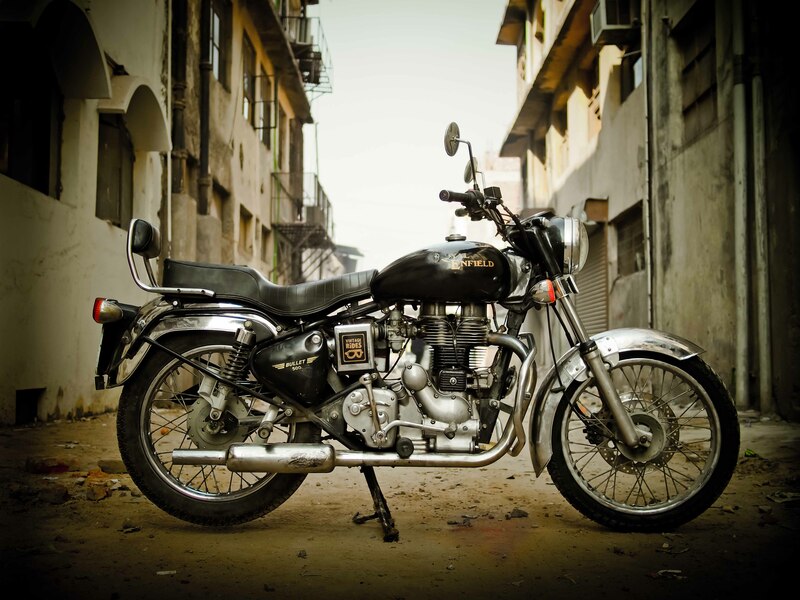 We’re a couple who are currently working in Mumbai and last year we bought a royal enfield! So now the plan is to go back home by bike! So the question is can you give us just an idea about your journey? which countries did you cross? We would really appreciate all your tips and suggestions! First of all I would just make sure you have some realistic expectations. One thing to think about it do you care what happens to the bike when you arrive in Italy. Because it will be crazy expensive (if not simply impossible) to get a newer model Enfield legally registered under EU standards to drive in Italy. It is easier (but still hard and expensive) if it is an older model…older than 30 years, then it is considered “historic” and there are different rules. So that is one thing to consider. The other is simply that it is hard 😬. Depending on what year and model Enfield you have you are very limited in the speeds you can comfortably travel without putting the engine at risk. Its not a big problem in India where there are thousands of Enfiled mechanics and cheap parts, but once out of India you need to baby the bike. We thought it would take 3 months, it took 5. Then there is the issue of your mechanic abilities, again, depending on the bike you can expect to have plenty of problems, and its good if you know how to fix at least the minor issues. Then there is the paperwork. To leave India you will need the bike registered in your name. Then there is the route, which is brings questions about visas and other documents needed. You mentioned Pakistan. Yes, its not so safe, but also you need to research if they will even let you into Pakistan with Indian license plates. ang once in Pakistan you would need to pass through Iran, which requires a carnet de passage, another whole topic and challenge in itself. For visa reasons we could not go that way so we were forced into taking the northern route through The Stans. but even then if you want to do that overland you need to pass through pakistan and China to arrive in Kyrgyzstan, but at least when I was there it was very difficult to get the bike into Pakistan (that might have changed) and then would cost thousands of euros in permits and guides just to pass through about 300km of China (that has definitely not changed), so we dismantled the bike, put it in a crate, and flew it to Kyrgyzstan and then went the rest of the way from there overland. You will find more about our route on my blog. In conclusion…there is a MASSIVE amount of planning and preparation you need for a trip like this. It can be done, but it will not happen easily. The payoff is amazing though. It was a great experience. A good resource to start with are the forums in horizonsunlimited.com Search past posts looking for answers before you repost a question someone has already asked. Also caravanistan.com has good info.